Cleveland – June 29, 2014 – Spectators, collectors, buyers and sellers = 2,115 attendees. Entry donations, sponsorships and table registrations = $23,510 for charity. The fourth Cleveland’s Got Sole Sneaker Showcase held on Sunday, June 22 at Quicken Loans Arena shattered previous records in all areas. 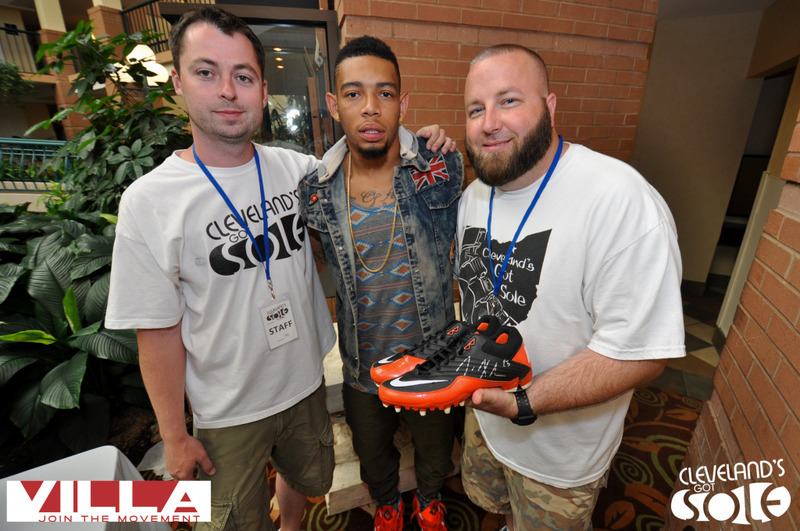 Kramer, with co-chairperson Andrew Watts of Cleveland, have partnered with Quicken Loans Arena, VILLA and countless others to host one of the Midwest’s largest sneaker showcases. All proceeds from the 2014 show will be donated to the Children’s Tumor Foundation to increase awareness of neurofibromatosis (NF), a disease causing tumors to grow on nerves throughout the body that can lead to blindness, bone abnormalities, cancer, deafness, disfigurement, learning disabilities, and excruciating and disabling pain. “There is no known cure for neurofibromatosis, but the $23,510 raised at CGS4 will support research to discover better treatments and to find a cure,” Watts said. An avid shoe collector for years, Kevin Kramer had traveled to shoe shows throughout the United States to display his collections. In passing one day, someone said, “Hey, you should host a show.” And that’s how this started. Kevin did some research and realized that no one in the Midwest had hosted a shoe show before Cleveland’s Got Sole’s first event in 2008. He decided to be the first to invite “sneakerheads,” his friends, colleagues and shoe-lovers for a great event of displaying, selling and trading shoes. Cleveland’s Got Sole was born! Andrew Watts joined Kevin as a co-chair in 2010. But he wanted to give Cleveland’s Got Sole a deeper meaning! Unlike most other shows that are income-generators for promoters, Cleveland’s Got Sole raises money for charity. In just three shows, the Cleveland’s Got Sole team has donated more than $20,000 to nonprofit organizations, giving $11,000 away in 2012 alone. To find out more about Cleveland’s Got Sole, visit http://clevelandsgotsole.org or view event pictures on Facebook at https://www.facebook.com/ClevelandsGotSole/photos_stream. The Children’s Tumor Foundation is a 501(c)(3) not-for-profit organization that is dedicated to improving the health and well-being of the millions of people worldwide living with neurofibromatosis (NF), a term for three distinct disorders: NF1, NF2 and schwannomatosis. NF causes tumors to grow on nerves throughout the body and can lead to blindness, bone abnormalities, cancer, deafness, disfigurement, learning disabilities, and excruciating and disabling pain. NF is under-recognized and underdiagnosed yet affects more people than cystic fibrosis, Duchenne muscular dystrophy and Huntington’s disease combined. The Children’s Tumor Foundation funds critical research to find treatments for NF. In addition to benefiting those who live with neurofibromatosis, this research is shedding new light on several forms of cancer, brain tumors, bone abnormalities and learning disabilities, ultimately benefiting the broader community. For more information, please visit www.ctf.org.